The people brought together the five nations on the shore to bury the weapons of war and form our government . The Grand Council of the Haudenosaunee Confederacy continues to this day to meet at the Onondaga Lake. 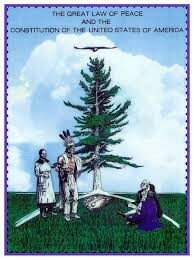 The English Haudenosaunee means " The people of the long house". There was a war over 1,000 years ago. They suffered greatly after the Euro-American settlers came to their lands. The Euro-American settlers brought diseases and they attacked the Haudenosaunee settlements.